Figurative art always tells a story. That story may be ambiguous, but it is always a part of the viewing experience. Figurative art is a story about us, for us and is us. To me, a piece of art has three components. The first is the artist's concept. The second is what the piece itself seems to say independent of the artist's intent. The third and most important component is the myriad of thoughts, feelings, knowledge and imagination that the viewer brings to the art. It is the combination that gives art it's meaning. 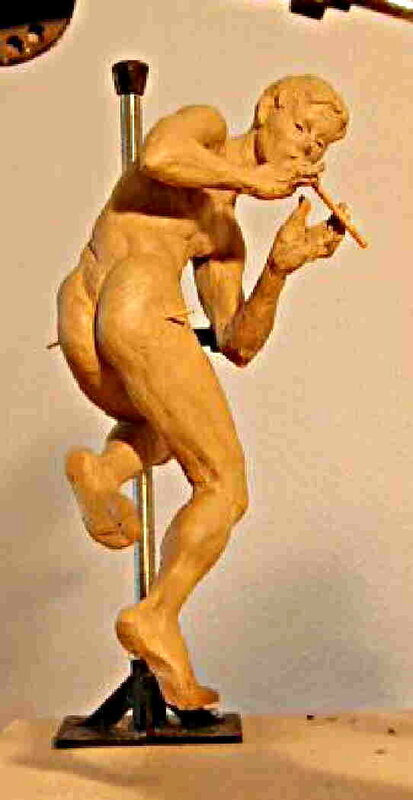 Follow my sculpture "Duet" from conception to finished clay before it went to the foundry. Since I work with figures, the image in my mind had the rhythm of human motion. After a few sketches the concept looked like this. I decided on a scale that made the figures about 22 inches. 1/8" aluminum wire was bent to make a skeleton like armature. 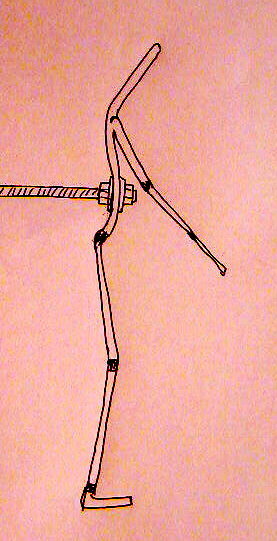 A space about belly button high was bent to accept a rod that connects the armature to it's supporting stand. The positions of the shoulder joints, elbows, wrists, hips, knees, and ankles were marked. Since this piece consisted of a male and a female, the separate armatures reflect the anatomical differences. 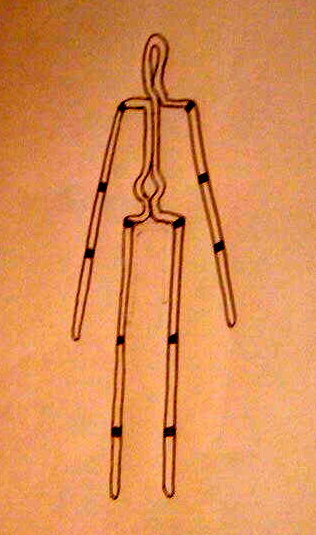 The female armature was shorter with slightly wider hips and narrower shoulders. 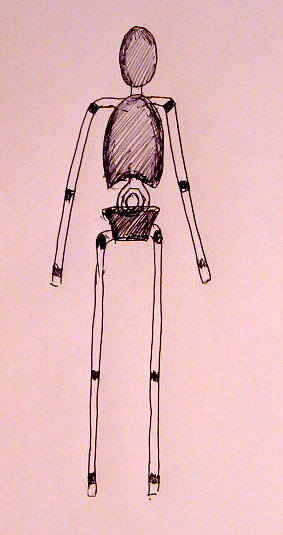 The armatures were bent into a standing skeleton posture and a threaded rod attached to each. Three shaped blocks of clay were used to form the pelvis, rib cage and skull. The skull of both figures were about the same size. The female's pelvis is lower and tilted forward and her thorax is smaller than the male's. All the armature work to this point had been painstaking. 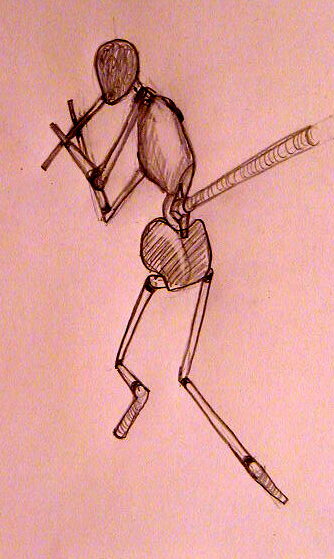 Now the fun part started as I bent and twisted the skeleton to get the gesture I originally envisioned . I'm was careful to bend the armature only where a human can bend, but within the limits of motion, I was free to exaggerate and experiment. The next step was to begin fleshing out the figure with muscle, being careful not to make any part of the figure too detailed at this stage. 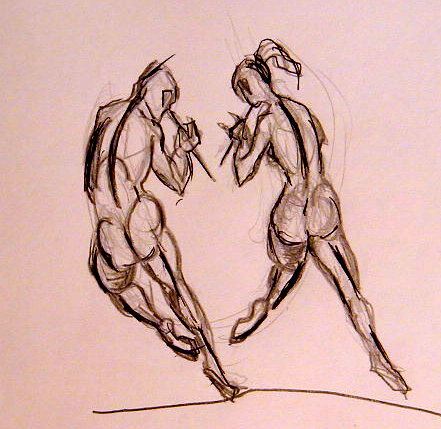 While each figure had to develop it's own charm and gesture, the interaction between the two had to work as well. After sculpting many more details, the figures started to take on their final appearance. The figures were nearly finished at this point. To me, these two are keenly aware of the others presence and are dancing and piping a joyful duet. I leave it to the viewers imagination to complete the story: What are they, who are they, what are they doing and why? To see the finished bronze of "Duet" click on Small Works.